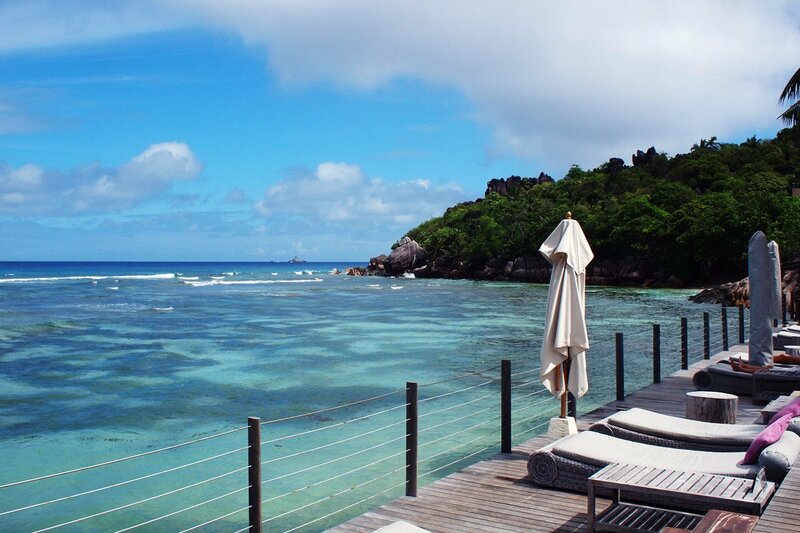 La Digue`s best and most romantic hotel! 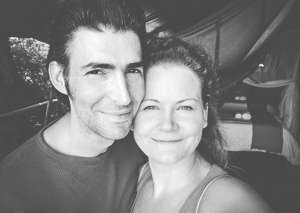 After 10 hours flight to Mahe, 20 minutes flight with Air Seychelles to Praslin and a 15 minutes ferry trip, Marcus and I finally arrived in heavenly La Digue. Pu! In the little harbor town „La Passe“ hotel stuff drove us via little golf carts to the hotel. 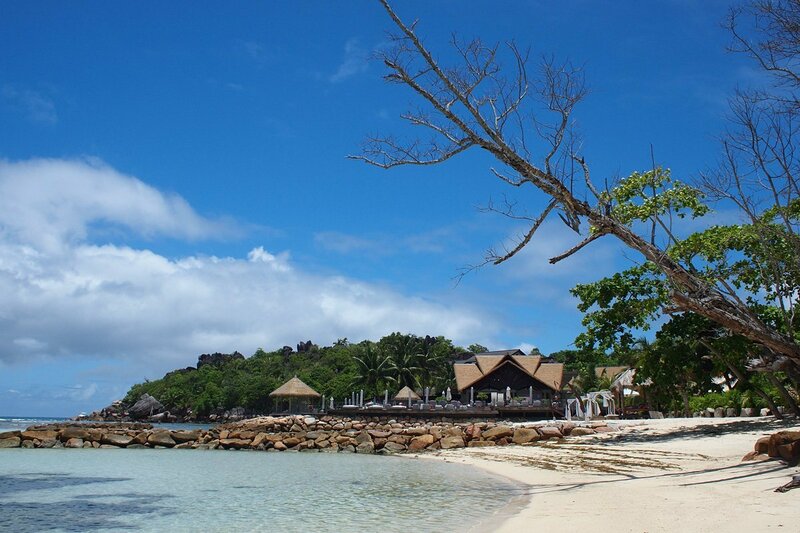 The hotel „Le Domaine“ is in the North of the island and with its 45 guestrooms a lovely place to relax. Refreshing tissue, a cold drink and warm hotel personnel sweetened our arrival. The personnel is a true enrichment fort the hotel and especially fort the guests: everybody is very nice and makes every effort to make the guests´ dreams come true. You can recognize that they love their job (that wasn`t the case at our second hotel „Hilton Labriz“). At Le Domaine you feel at home immediately. All the waiters are little talented linguists. Sometimes the personnel even danced while working – very pleasant. The relaxed personnel create the right atmosphere. The hotel has a beautiful beach. But La Digue is he island where the legendary Barcadi clip was made, so you definitely has to take a 20-30 minutes trip by bike to the famous Bacardi-beach „Anse Source d´Argent“! You can rent bikes at the hotel for free. So you can drive around and experience the normal life of the locals. There are almost no cars at La Digue. 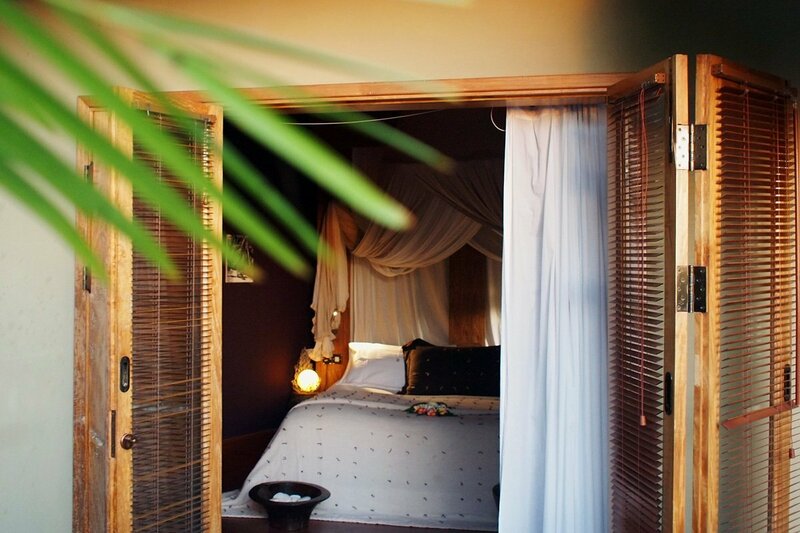 Our sleeping and relaxing place was „Villas de Charme“ with terrace, outdoor pool and a spectacular sea view. 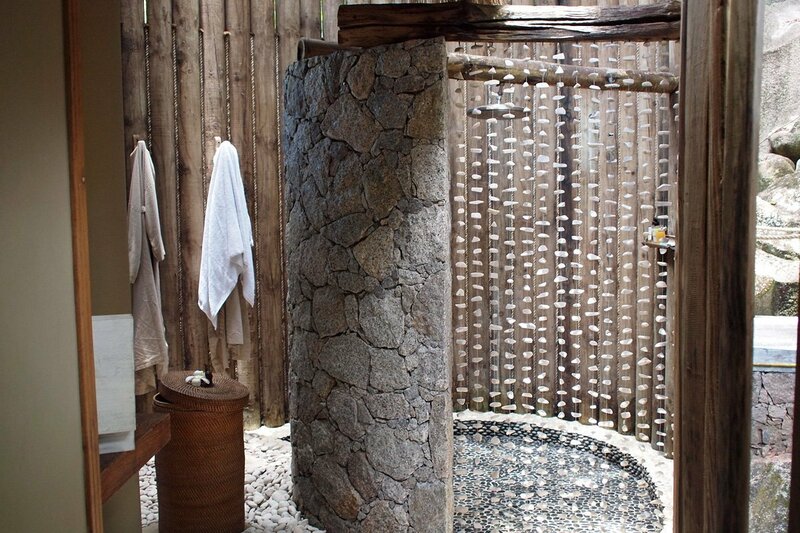 If you book an upgrade the “Villas de Charme Elegance” also have an outdoor-jacuzzi. And to pretend to much walking, they drive you around with little electric cars. 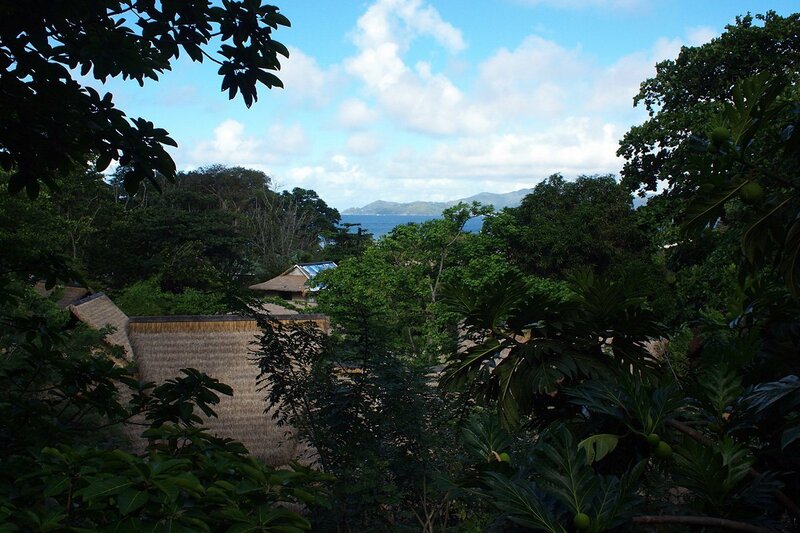 Villas de Charme are lovely tree houses in African/Asiatic style with much privacy. 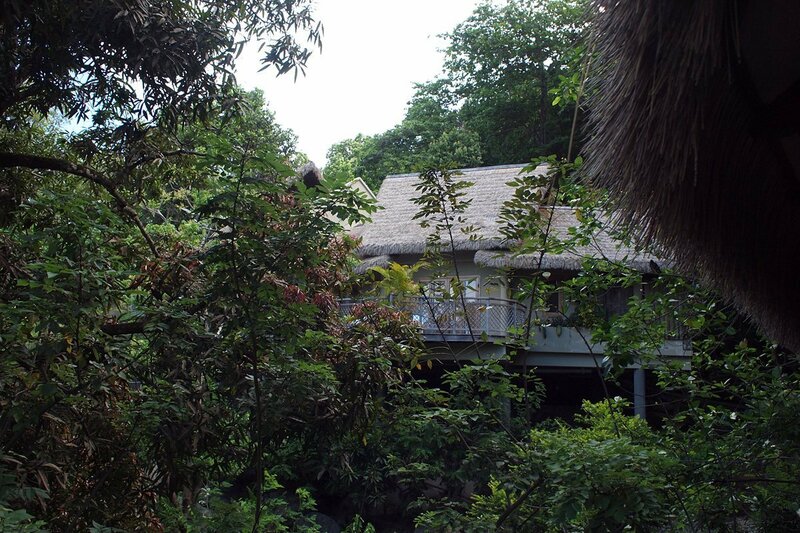 They are built into the edge of the rainforest. Everything is arranged generously so that you don´t even recognize your neighbors. The outdoor pool, the villa, the terrace, the bed with mosquito net, the turndown service with goodnight snack, the lovely little gifts and attention for detail – everything unique. 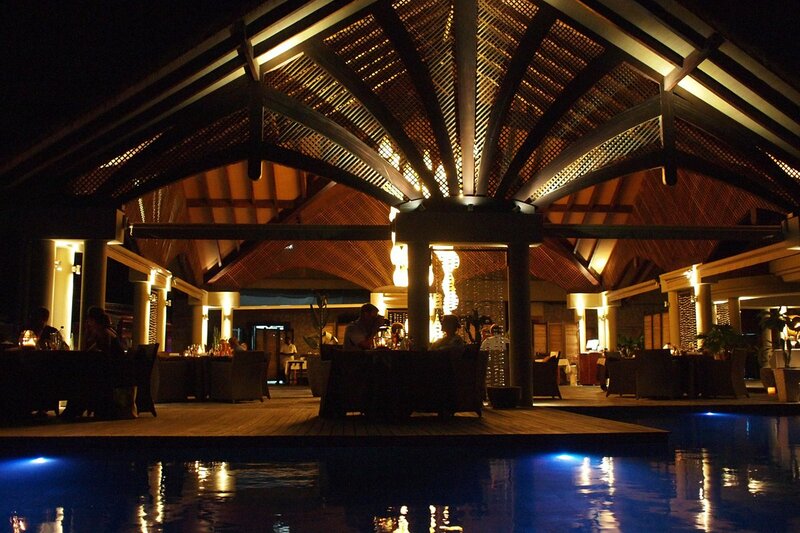 Thanks to special light arrangements – a wonderful romantic atmosphere comes up at night. The great outdoor pool with shower! 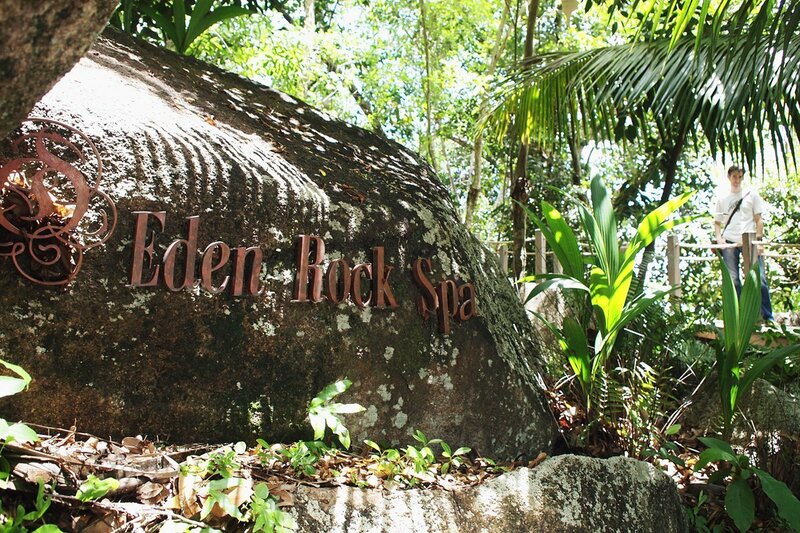 „Rock Eden Spa” is a wellness center that belongs to the hotel. 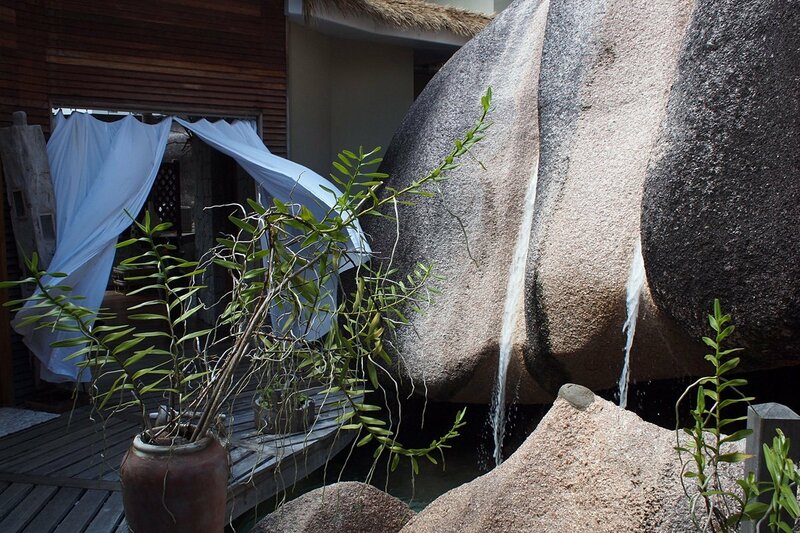 It has a breathtaking sea view surrounded by La Digue´s granite rocks. 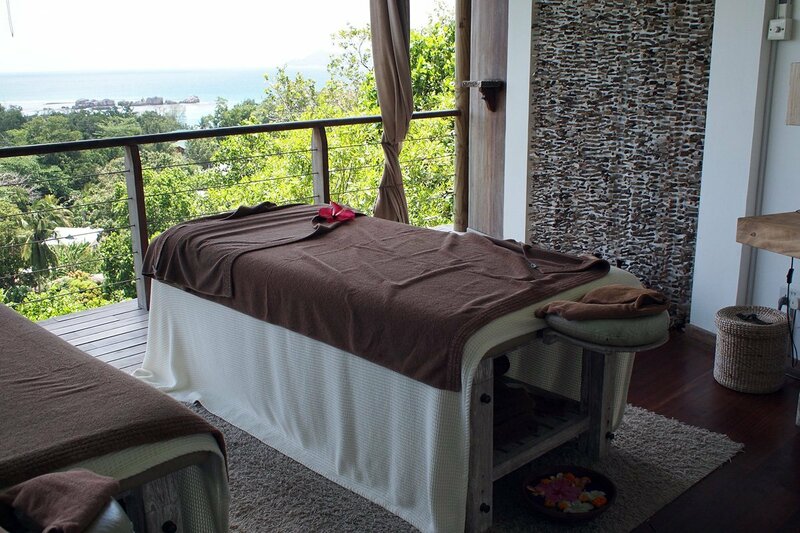 The massages were super relaxing and very pleasant. 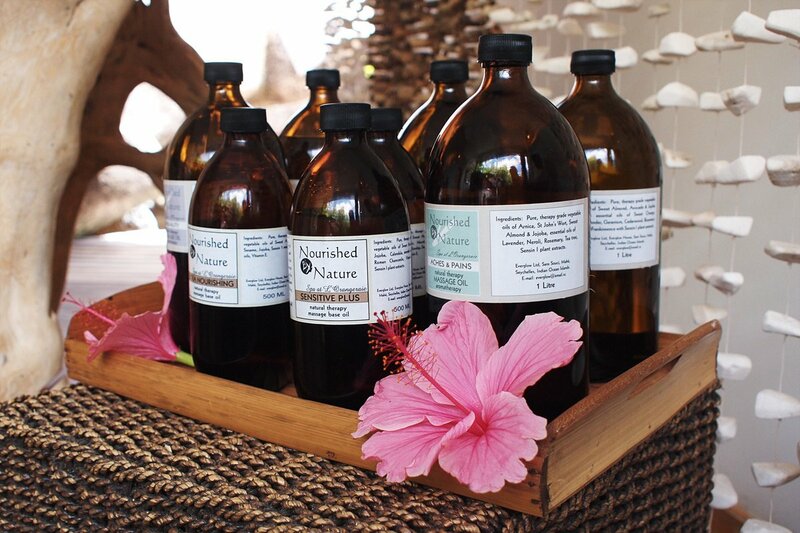 The products they use are based on natural substances. The ventilator was a bit cold but anyway Der „Rock Eden Spa” is definitely recommendable. At night everything is lighted by candles and torches. Annoying animation doesn´t exist. Just a wonderful calm unique atmosphere, some good singers or entertaining creole dancers. 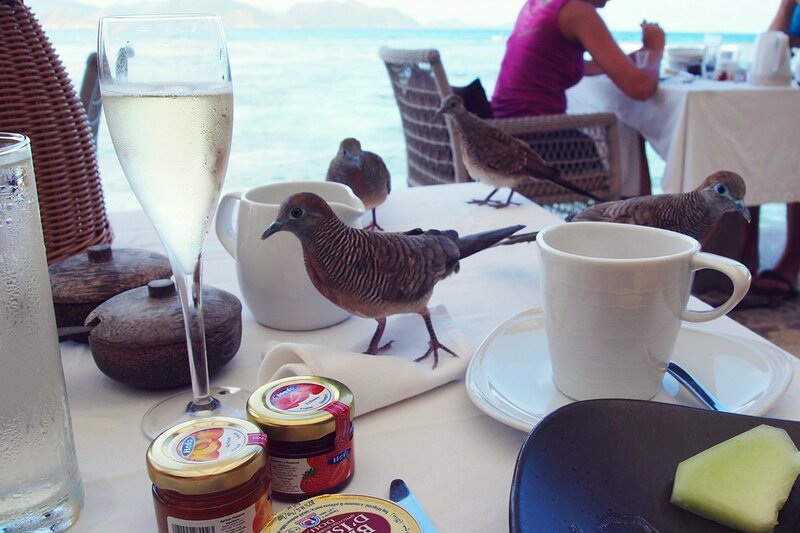 These cute little birds were our all morning breakfast guests. Other guests were annoyed but we loved them ! 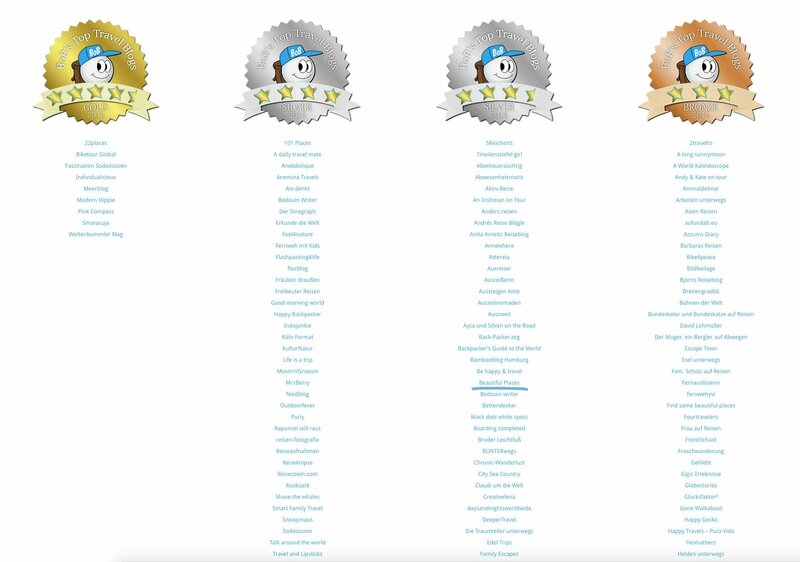 10 /10.30 was breakfast time, 7 am – time for dinner. Every time ate we had a wonderful view to the Indian Ocean. Also it was possible to book a romantic dinner at the beach or at the pool. The climate was wonderful, sometimes a little rainy in the morning or evening. During the day there is sunshine at 30° and around 25 °degrees at night. The locals’ recommendation is to visit the island in November. Like I already said – the hotel service was unbeatable. Also the bottle of wine – you didn´t finish the night before, you can get back the next evening – that make the hotel simpatico and saves money ;). 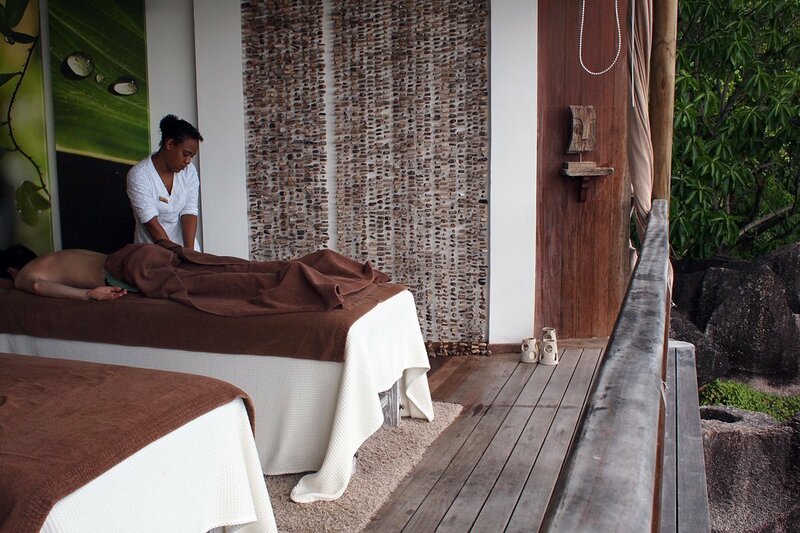 Le Domaine is very unique and a heavenly dream – a true romantic pearl. It was the most beautiful hotel on our journeys so far. I think this is the place where paradise is at home. 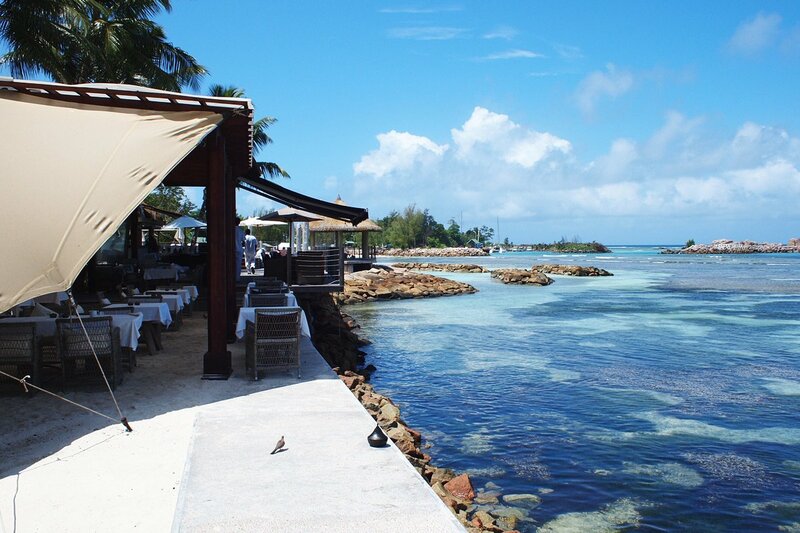 La Digue, Le Domaine – we will definitely come back! P.S. 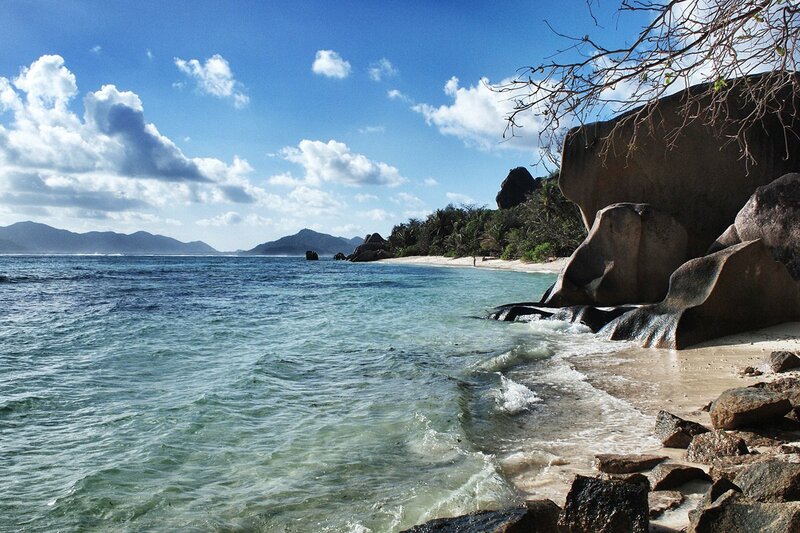 We had our dream marriage at the beach Anse Source d’Argent. Price: 6 = 7 Honeymoon-offer: 1 fruit basket at your room, 1 glass of Champagner, a 30- minute Manicure or Pedicure for the bride and a romantic candle-light-dinner.